In August of 2009 I tried my hand at benchmarking and running a dual-card setup on my own machine. I had recently purchased an ATI Radeon HD 4830, which was a lower-midrange video card at the time but had really good value in terms of performance for its price. So I bought a second, identical card (which I later returned), and ran them in crossfire to map out their benefits in real-world game tests. It was a fun experiment and I enjoyed the process of testing hardware. 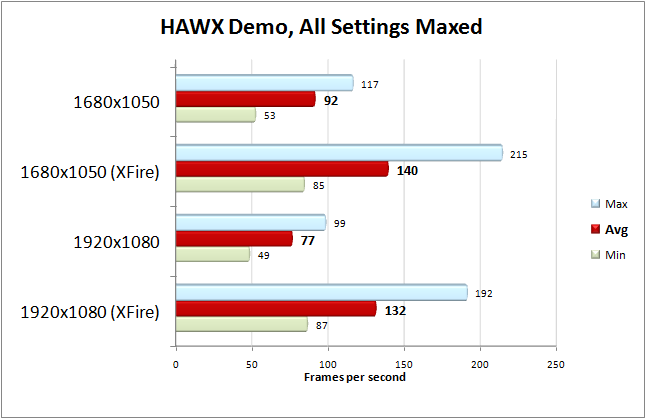 There is a built-in test run in HAWX called “Test Performance” under Video Settings. Although this utility outputs an Average and Max FPS, the Max results were always way too high to be accurate. I therefore I used FRAPS to capture FPS stats. 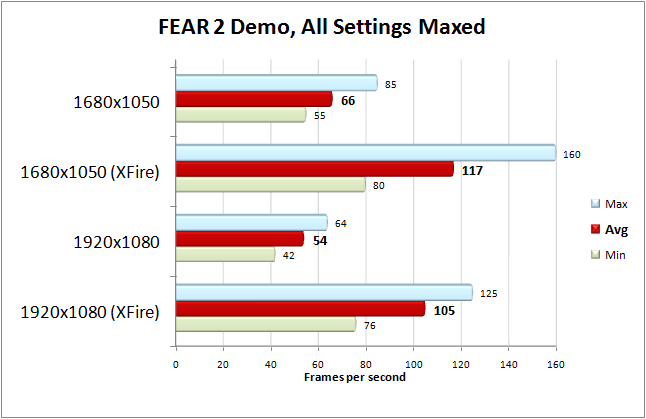 Fear 2 Demo had no benching system that I could find, neither built-in or 3rd party. Worse, the game doesn’t keep my saved checkpoint after I quit the game. So for each benchmarking set, I had to sit through the intro and play up to the point where I fight a bunch of guys in a cafeteria. I did multiple runs for each test, using FRAPS to capture stats, and averaged out each set of runs. I used two different time demos for Half Life2 Episode 2. PortalStorm is a 25-second, physics-intensive scene from the first few minutes of the game where the citadel’s super portal releases a portal storm, flinging debris and nearby objects into the air, and causing an overhanging bridge to collapse. DriveToBase is a 36-second race with Dog from a river to the base at White Forrest, and is more representative of the majority of the gameplay in this game. Demos were very easy to record and play back using Source’s command console. Stats were captured using FRAPS, and three runs were averaged for each set of tests. Model Detail: High; Texture detail: Very High; Shader Detail: High; Water Detail: Reflect all; Shadow Detail: High; Color Correction: Enabled; MSAA: 8x; AF: 16x; VSync: disabled; Motion Blur: Enabled; Field of View: 90.00; Multicore Rendering: unavailable; High Dynamic Range: Full; Use ‘bloom’ effect when available: unavailable. 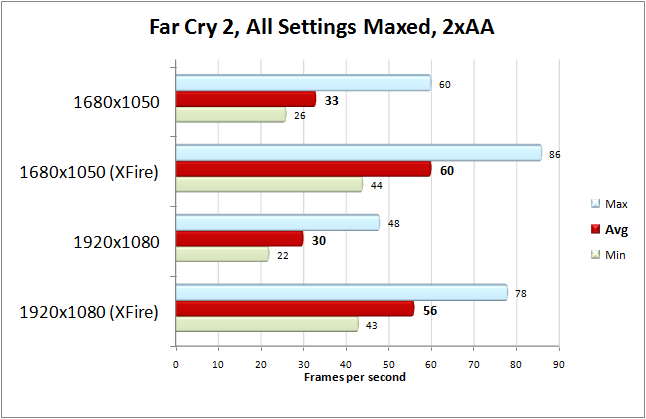 I’d like to salute the makers of Far Cry 2 for making the easiest benchmarking system out of all. All you have to do to start the built-in utility is right-click on the game’s icon in the Start Menu and select “Benchmark”. THAT’S IT. At the end of a test you’re presented with a results page that not only gives you detailed stats, but actually automatically averages all the runs for you. I ran the “ranch small” time demo in DX10, 3 loops per set. 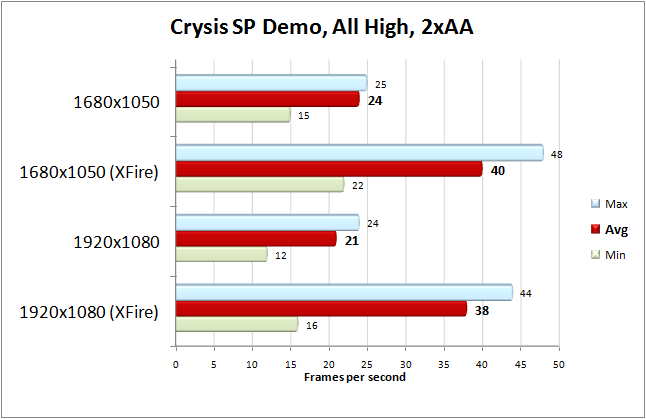 I used the popular Crysis Benchmarking Tool for this test. Unfortunately, DX10 and 64bit wouldn’t work for some reason, so I stuck to DX9 (according to talk online, there isn’t much difference in performance). I ran the “benchmark_gpu” timedemo, 3 loops per set, and had the time of day set at the default 9AM. This game demo had a problem in CrossFire mode, where various objects in the game (random trees, shrubs, rocks, etc) would rapidly flicker. 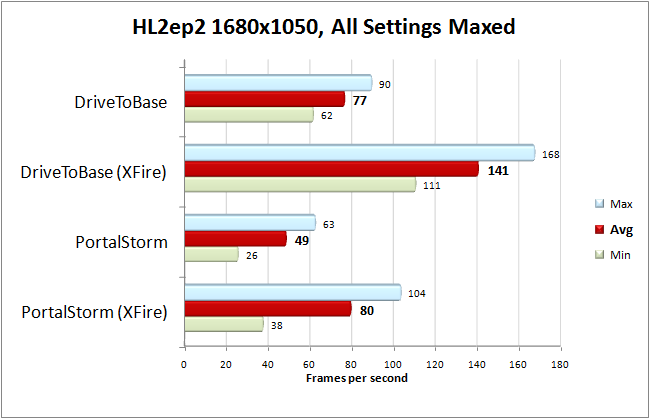 I’m guessing CrossFire was rendering each frame using alternate GPUs, and some objects were somehow loaded into one card but not the other. Since this demo is the prerelease demo, this and other problems in the game were probably fixed in later patches. Unfortunately, Crytek did not provide any updated demo to this game, nor a demo to their follow-up game Crysis Warhead. Unfortunately, VSync cannot be disabled in this game so there was no point benchmarking it. Even on a single 4830 on the highest settings, the framerate stayed generally at the 60fps ceiling. TweakGuides suggests a hack to this limitation, but unfortunately it did not work for me. Update: I’ve been asked to clarify why I didn’t benchmark Fallout 3. There is a phenomenon in every animated 3d game and environment called screen tearing, where the image on screen looks sliced at various parts during rapid panning (such as when you look left or right in a first person game). This can be jarring and it removes from the realism of the scene. VSync is a feature that can be included/enabled in most games which solves this problem, eliminating these jaggies during panning. But one byproduct of VSync is that it prevents the game’s framerate from going any higher than 60fps (which is the monitor’s refresh rate). When I tried benchmarking Fallout 3, even at the most taxing configuration (highest graphics settings, highest resolution, single video card) the framerate was stuck at 60fps, and this was because VSync was enabled in the game. It also couldn’t be disabled. 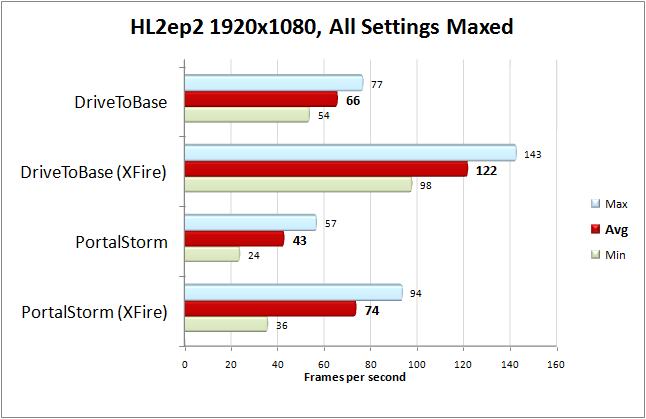 So, were I to benchmark it, I would simply get a whole graph showing 60fps across the board. So suffice it to say, the 4830 has power to spare for playing Fallout 3. It just can’t be benchmarked.